Iranian director Asghar Farhadi poses for his film "the Salesman" during the premier in Paris, Monday, Oct. 10, 2016. The motion picture academy calls "extremely troubling," the possible visa ban of Iranian director Asghar Farhadi, whose feature film "The Salesman" is nominated for a best foreign language Oscar. In a statement released Saturday, the Academy of Motion Picture Arts and Sciences expressed concern that Farhadi and his cast and crew may not be permitted to attend next month's Oscar ceremony in Los Angeles following President Trump's plan to temporarily suspend issuing visas for people from Iran and six other Muslim countries. 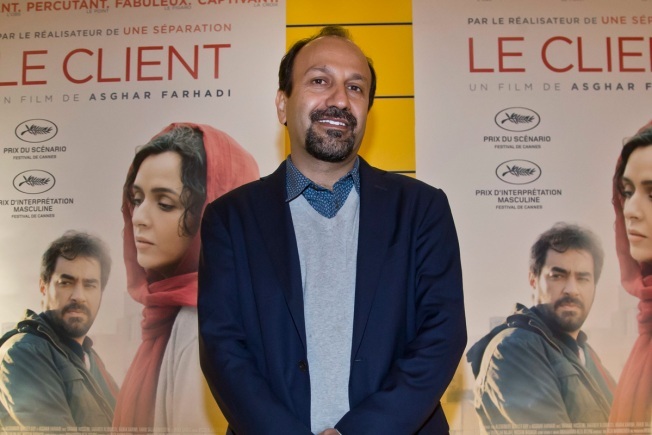 Farhadi has not commented on his travel plans, but on Friday, the president of the National Iranian American Council, Trita Parsi, tweeted: "Confirmed: Iran's Asghar Farhadi won't be let into the US to attend Oscar's." In its statement Saturday, the academy said, "As supporters of filmmakers — and the human rights of all people — around the globe, we find it extremely troubling that Asghar Farhadi, the director of the Oscar-winning film from Iran "A Separation," along with the cast and crew of this year's Oscar-nominated film "The Salesman," could be barred from entering the country because of their religion or country of origin."